Not so long ago VIA released VIA KT333 - a chipset with the advanced DDR memory controller for systems based on AMD processors. And it took no time for board makers to make boards on this chipset even before its updated version was released - KT333A. 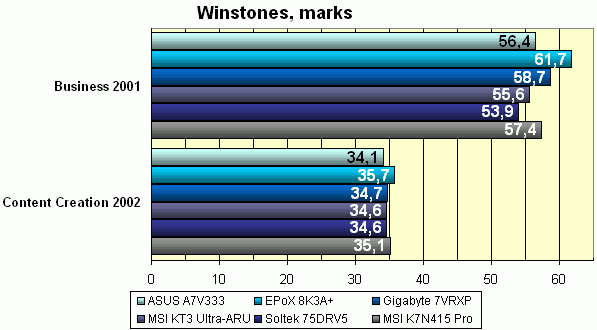 Our test showed that the KT333 is the fastest chipset for the Athlon XP. Unfortunately, all KT333 boards we got in our lab are based on the VT8233A south bridge: its ATA133 support is useless for most of users and it carries nothing more interesting. Besides, the DDR333 memory is not widely available, and it gives too little gain as compared with the DDR266 on the KT266A. Nevertheless, the KT333 boards will definitely sell well, like boards on the NVIDIA nForce 415-D. The latter has a very interesting life: first, everybody was delighted with the chipset with integrated nForce 420-D video system. Some time later it was clear that the chipset would never become popular because it was unbalanced: excellent operation with memory and a very good south bridge were coupled with a graphics core of far not the hi-end level. The integrated video was superfluous for office workers and not enough powerful for gamers. 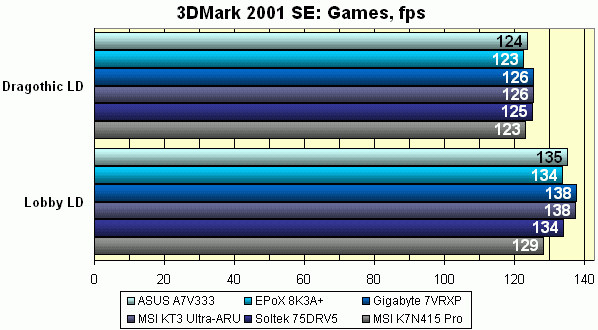 Nevertheless, the company released a cheaper version having taken out the graphics core; the solution had the same performance as the nForce 420-D (the second position among Athlon platforms). Today we are going to test 5 boards on the VIA KT333 chipset and one on the NVIDIA nForce 415-D. All models are from top companies, i.e. for those who want to squeeze everything out of the Athlon XP. Note that the Gigabyte and Soltek boards were tested earlier. The synthetic tests which measure a memory throughput when data blocks are read/recorded using Stream algorithms do not give a clear idea of performance in real applications, but the results are very interesting. 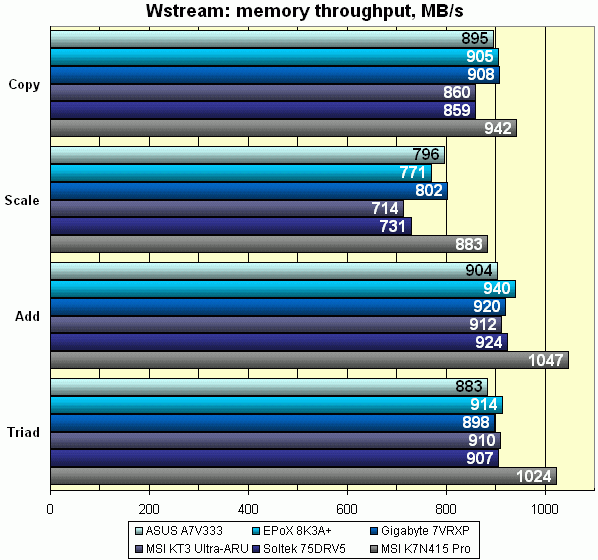 Although the ASUSTeK and EPoX fall behind in the read speed in the Cachemem, they have a higher write speed, and the Wstream shows that the MSI and Soltek cards have a greater access latency. The MSI K7N415 Pro goes separately demonstrating strong sides (memory writing and stream reading with the DASP) and weak sides (random memory reading) of its chipset. Note that these tests can help find out why some boards fall behind others, but they can't forecast operation in real tests. The equal results in the MP3 encoding are not surprising. But almost unnoticeable difference in the MPEG4 encoding results makes us finish the investigation because this test finds very well all drawbacks and weaker capabilities in optimization of operation with memory in real applications. 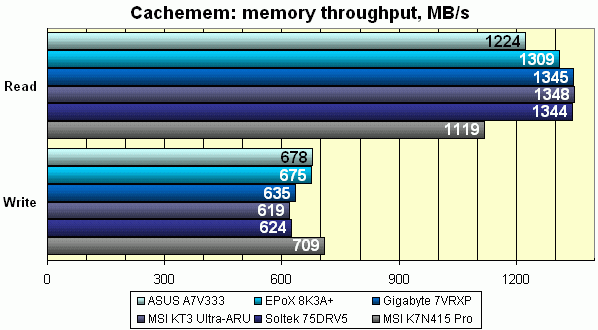 The EPoX 8K3A+ takes a lead, but the gap is only 1%. Here the EPoX leads again though the spread in the results among the KT333 boards is only 1.5%, and the MSI K7N415 Pro performs better at the expense of the DASP (the gain could have been greater if it was not excellent operation with memory of the competitors). The spread in values here is great, and now the results are proven by the SYSmark. The EPoX 8K3A+ takes the first place in the office test; the Soltek looks very pale; the NVIDIA board takes the middle. In the content creation tests the gap doesn't exceed 5%, but we still can't mark a leader, and in the Business/Office part the difference is greater (15% and 8%). Note that there is no any processor frequency increase (we measured the frequency of the Athlon XP 2100+ on the EPoX board with the WCPUID program, and it was 1737 MHz), that is why the conditions are equal. Now let's move to operation with 3D graphics and AGP realization. The SPECviewperf tests can find all minor flaws, and I must admit that none of the boards failed. The Gigabyte, MSI and Soltek perform a little better, and the MSI K7N415 Pro takes a fair last place (because of the poor GART driver realization of NVIDIA). 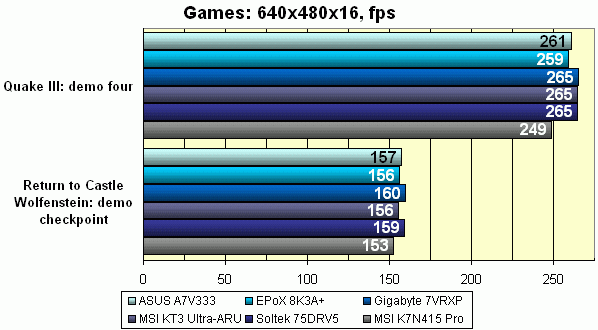 The situation in games is very close to what we had in the OpenGL applications of the SPECviewperf: all KT333 boards go on a par, the Gigabyte a bit better and the EPoX a tad worse (the gap is less than 3%), and the MSI nForce 415-D board falls behind by 3-5%. None of the tested KT333 boards is too far ahead or behind. 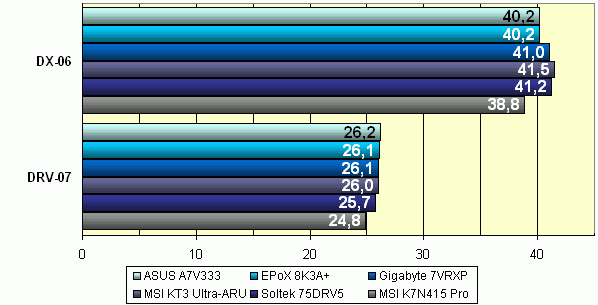 The EPoX 8K3A+ and Gigabyte 7VRXP have better results, but the other boards lag behind not more than by 3%. Only the MSI K7N415 Pro is less efficient in the tests, but here the choice must depend on the chipsets (which one a user prefers), and price difference accentuates the chipset difference. 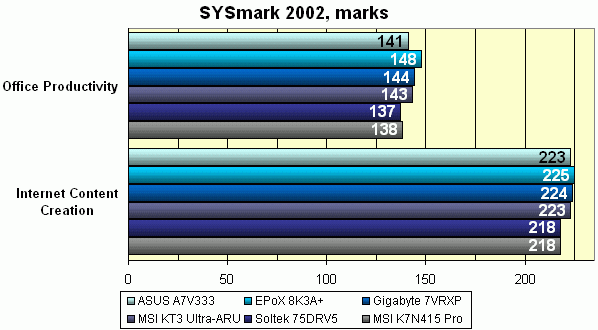 But in this review we were not going to compare the chipsets (for this see VIA KT333 and NVIDIA nForce reviews). Before making the final conclusion take a look at the capabilities of each board as characteristics are often much more important than a minor performance difference.